This blog post about the recent Presidential election is a podcast. “I’d like to offer this for consideration. Infinite Omnipresence doesn’t actually “do”. Nothing can be added to already infinite perfection. 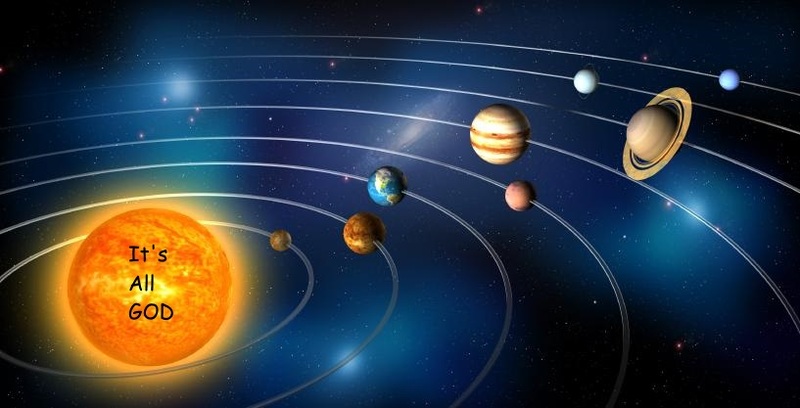 The analogy of God maintaining the orbits of planets is more likely as not tending to encourage the view of separate things being governed by God. Doing is as outdated and obsolete as “in” or “becoming”. When I posted that excerpt from God Is All, I did not intend to lead anyone into the ditch of dualism. I did make the false assumption that readers of that post (most anyway) had already read God Is All and understood that God, the one inseparable presence and power, is all there is of the planets. Moving on. Should we ditch the word “do”? Not yet! One definition of the word “do” is to be active. God is not only active, but is Activity Itself. This entire universe is alive as the activity (the doingness) of God. The entire universe. This means your Being/Body is the doingness of God. The so-called planets in orbit are the doingness of God. It is true that God is not doing in the sense of bringing about something, but God is busy in the scintillating and shimmering Activity of Being Itself – Being Itself as Your Self. In the visual experience of illumination, you literally see God’s Doingness (Activity). Is God Doing the Hurricanes and Avalanches? No is the short answer. The long answer is God’s doingness is always consistent with God’s nature which is Infinite Indivisibility – LOVE. To be active as violent hurricanes and avalanches, God would have to be self-destructive. Reader, answer this question: Is destruction Love in action? Then no seemingly destructive activity is the activity of God. Then, what is it? NOTHING. Are you thinking, “Allen, you can’t really mean that?” Yes, I do. There are many reports on record of praying people who have seemingly stopped hurricanes, typhoons, and tornadoes in their deadly tracks. Explaining how they prayed, they report something like “I just realized only God was present, only God was power. Note the word only. It immediately cancels out the presence and power of hurricanes and the like. The word only immediately reveals them to be NO THING. Each morning, remind yourself that you ARE Perfection’s Infinite, Indivisible Activity. Don’t be selfish. Know that everyone (and everything) you see is Perfection’s Infinite, Indivisible Activity – God’s Doingness. Reader, how can you possibly run into discord and inharmony when you know that ALL ACTIVITY IS THE ONE INDIVISIBLE PRESENCE IN ACTION. With these daily reminders, you have to report that your life seems to be running as smoothly as a well-oiled machine. In the next post, we will take God’s activity into the business arena.